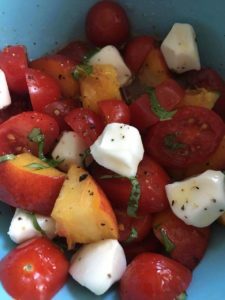 This a fresh take on summer with peaches, tomatoes, mozzarella and basil! Just the words are a burst of flavor! Spicewood Food Company Peach Barrel Aged White Balsamic Vinegar is being used and can be ordered by clicking on the icon on my home site or by clicking on Spicewood. Recipe and photo courtesy of Betsy Konkolewski. Prep all ingredients, add to a bowl and stir in vinegar and oil. Add salt and pepper to taste and enjoy!